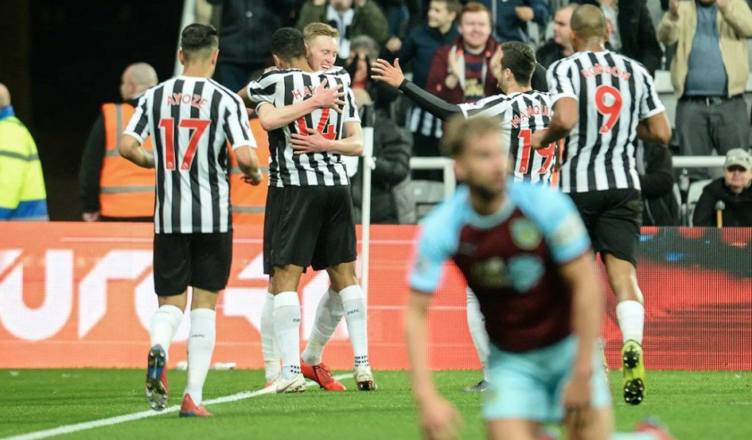 Newcastle 2-0 Burnley: Magic moments from Schar & Longstaff cap off perfect 4 days – NUFC blog – Newcastle United blog – NUFC Fixtures, News and Forum. 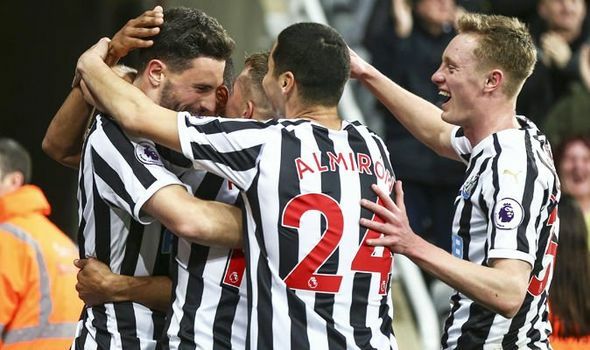 Another big win at St James’ Park tonight, with a stunner from Fabian Schar and Sean Longstaff’s first Premier League goal handing us a well earned win over Burnley. It’s our fourth consecutive league victory at St James’ Park and one that not only moves us up to 13th, but 7 points clear of the bottom three. Once again we looked far more fluid with the three amigos (Rondon, Perez and Almiron) up top, with us playing some lovely stuff in the first half before putting in an resolute second 45 to preserve our clean sheet and deny Burnley any route back into it. I said before the game that we may need something special to beat an in-form Tom Heaton – who’d helped Burnley to 3 draws and 5 wins in his last 8 games following his return from injury – and Fabian Schar delivered exactly that! The fact Rafa picked him up for £3m is another exceptional piece of business, with him showing once again tonight that he is not only a goal threat and an impressive creator from deep, but also a fierce competitor at the back. He wasn’t the only one who was brilliant tonight either. Longstaff put in another classy display and deserved his goal, Almiron, Perez and Rondon all put in a shift but also linked up nicely once again, Hayden played the spoiler role perfectly, Lejeune put in another Rolls Royce display at the back, Lacelles stood up to the physical test of Wood, Barnes and Crouch brilliantly and Dubravak looked anything but short on confidence, with him claiming several high balls into the box expertly. Elsewhere, Cardiff were hammered at home against Everton, capping off an awful 4 days for them, while Brighton’s slumped continued with a 2-1 defeat at Leicester. Next up we have a potential tricky trip to West Ham this weekend, although that isn’t a game I fear given our resilience on the road of late. We’re not safe just yet, but this just does not feel like a team that’s going down. If anything, we have every right to start looking up. 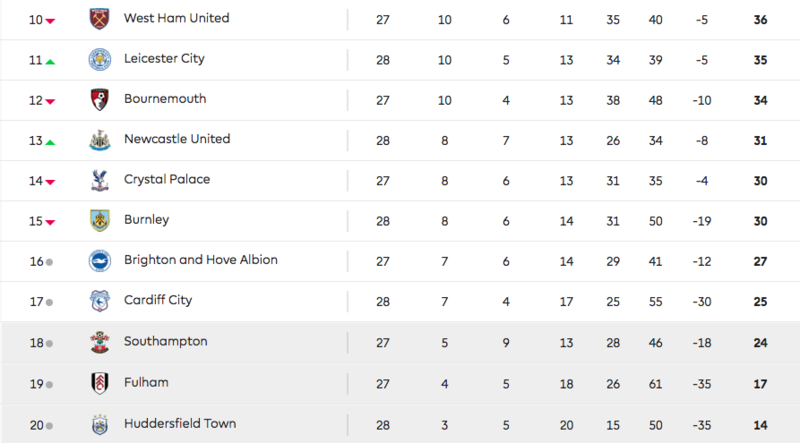 After all, a win at West Ham on Saturday and we’ll be just 2 points behind them and closing in on the top 10. Either way, what a 4 days it’s been. Two huge wins over relegation candidates, two clean sheets, two impressive outings for Almiron and so many quality performances all over the pitch. There’s a lot of comparisons now of Longstaff to Carrick. Tall and a Geordie. The kid looks extremely composed on the ball. With a bit more confidence and experience I would like him to be compared to another ex-West Ham product. Frank Lampard. He took a couple of years before he started to really press forward. What nobody is mentioning ANYWHERE is how we are playing so much better in the new formation. Rafa the old dog has learned a new trick. C’mon we have been really boring in his 4-3-2-1. Never really took the game to the opposition. Perhaps it is the personnel. Lejeune being back and Schar being settled allow us to pass out from the back. And they have been hitting some Shelvey-esque long balls. Whatever it is, lets all be happy about it because we are looking more like a front 3 now. I really didn’t like the lone striker approach with Perez as a presser. Much happier now. And well done Hayden again. I know I gave him some stick but he deserved it. He was acting like a wimp. Hopefully he has grown a pair in his personal life because he seems to have on the pitch. (Obviously, I will retract this statement if it turns out he had major family medical issues). Another complete team performance by the Toon. It would be tough to decide a MoM tonight but it is definately between the two goal scorers Schár & Longstaff with Hayden a touch behind. Now only one defeat in 8 games and some winable games coming up. We have 6 the best defence in the P.L. so we are hard to break down now we are scoring more regularly. Was a great performance and the future looks brighter if our best players stay fit and keep up that level of work. Longstaff and Hayden are a great partnership, such a shame Hayden wants or needs to leave. I never rated Hayden but he looks a different player alongside Sean, it’s that chemistry thing again isn’t it. motm Longstaff /Hayden joint winners for me, Sean had to tread carefully after his early yellow and Hayden upped his tackles to try and negate a second yellow going to Sean which Burnley were clearly trying to instigate. That’s teamwork right there. Nobody saw this coming. A kid from the Academy starring every week for the Toon. He’s young, a Geordie who wouldn’t look out of place for England, and getting better every week. I’m impressed and amazed. In my opinion he’s now ahead of Shelvey, Ki and Diame in the team. People have very short memories. There was talk of Shelvey going to the World Cup to be the Plan B. I wouldn’t write him off, but perhaps he can be our Plan B now. Him and Diame were pretty one note. They did their job well but the opposition could definitely plan for it. It was , Mo wins the ball, lays it off to Jonjo who tries to open up the opposition defense. We were very much a team of – how Shelvey goes so too does NUFC. And the goals and assists that you would expect haven’t really come from midfield. I am certainly not giving up on Jonjo because I thought he did well when Gayle was in the team to give him someone to pass to. Now with Almiron he can have an outlet. Perez seems to have a bit more space as well which is good for his clever little flicks and dinks. It’s hard to not get carried away because we have done quite well against some decent teams since we switched to the new formation. City, obviously. But we played pretty well against Spurs and Wolves who can be devastating on their day. Also, Burnley were in form and we reduced them to BFS-ball. They have the expression Sarri-ball so why not the Big Fat Sam-ball because we all know what it is!!! It seems to me the thing that Longstaff and Hayden have that jonjo doesn’t have is self discipline. Jonjo, still seems likely to lose his head, especially if we aren’t getting on top in a game, he gets frustrated too easily. Been and had a look on Ed’s. I usually don’t visit much as it is usually a b!tch and wind up fest (it is like having Troy Stavers back on here 🙂 ). Anyway, one of the fools said he thought Almiron had a crap game. It amazes me sometimes that people have no clue. Almiron was inches away from getting on the end of passes, kept the Burnley defense worried and on the back foot and was always open for a pass. Sometimes it’s the little things that can make a difference and we are a much better team with him in it. And Lejeune. I will say this again as well, but I am amazed at the transformation of Hayden. He had always looked a bit fair-to-average and now he looks like a taller NGolo Kante. Maybe he just needed to get his head on straight and there is probably nobody better than Rafa to help to do that. Eric, that site is one big **** fest, i try not to visit, maybe once in a blue moon but it never changes. I think Almiron would be even more effective in the position held by Perez especially as Ritchie could hardly ignore him there. It is so obvious to many fans that Ritchie seems to ignore Almiron that I would be surprised if Rafa hadn’t noticed it. It is a pity if Ritchie is deliberately ignoring Almiron, because he puts in so much effort for the team. Well after last nights win and tonight’s results, I think it’s the first time this season I have actually looked at teams above us and their points, rather than those below and where we are in relation to the bottom 3. Beat WHU and we would be 2 points off them, potentially moving us above B’mth. Rafa reckons 38pts is the magic number this season – I think 35 would probably do it based on the form of the bottom teams, but go for the 40 I say and if we got that many, based on everything else that’s gone on this season – I would say that would be a bigger achievement than last season. Sharpy: our goals are picking up a bit now. From Cardiff on we have 10 in 7. I think we can look forward to West Ham a bit now. We owe them for that 3 nil defeat at SJP. That was a really weird game where the teams were even but they had the rub of the green for the goals. I am not making excuses, it was just one of those games. Now, which West Ham will turn up? I have seen them this season when they are great and sometimes when they are shyte. I see Rafa being diplomatic and saying we can be top 8. I am getting a bit bored of this assumption that the top 6 are impregnable. It sort of looks that way because of the money disparity but in most leagues there are overachievers and it was that way in the PL. It will probably remain status quo but there are problems at the top 6. Abramovic seems to have lost interest. Arsenal need a whole new defense. Spurs have that stadium/spaceship to finance. When it was 400 million I am sure it was assumed it would pay for itself but at over 1 billion I think it will be a bit of a money pit for at least 10 years. Their budget is based on CL football every year which is by no means assured, especially if Poch goes to Man U or Real Madrid. Also, when they do these “richest clubs in the world” lists they only show revenue. Spurs and Athletico have huge stadium debts that in the short run will hold them back. We have about the same money coming in as Leicester and Everton and about half their payroll. And Everton are talking about a new 500 million pound stadium. The Fatman’s stinginess does give us options now. With just a cursory look at our finances you can see we are generating free cashflow of 50-70 million a year because our wages and transfer spend are so low. I am sure Ashley is pocketing this for now as he pays back the loan. But, as I said, it gives us options. We need a 20 goal a year player because Rafa has already build a better defense than most of the top 6 on about a 10th of the cost. Would Rangers deal with Ashley and vice versa? 10 games left is a nice round number so some of the papers are looking at the title run ins. Man City look to have it easier but I saw the nightmare scenario for the Scousers. They have us as their second last game. They still love Rafa but what if we spoil their party. We are not the same team they played on Boxing Day. Both personnel and tactics have changed a lot in the past 2 months. Paul Merson goes with 1-1. I think that is a safe prediction and probably what a lot of people will go with. It partly depends on which West Ham turn up but also if we can continue with our expansive football. We cannot get ahead of ourselves because this is NUFC, but saying that, we are least fun to watch again. We will see a lot of calls to keep a lid on it and not get too excited. Another good performance at West Ham though and I think it will bubble over. It is also the late feature game on Sky so we have the audience all to ourselves. I hate to go with Merse so I am going to say 2-1 NUFC. We had been playing better away from home anyway until recently and it looks like we have a system now that suits the players. God knows that 4-2-3-1 was drudgery sometimes where we would be having 30% possession even against mediocre teams. I am expecting something like the Wolves game where it was a bit more open than usual with both teams having chances and there being nothing in it. Kim – oh to be a Fulham fan. Your club spend £100m in the summer – great we mean business!!. But it starts bad, manager sacked – but wait, a PL winning manager comes in – great we mean business. But it continues bad – manager gets sacked and with 30pts still to play for, they put Parker in charge – zero experience and a mountain to climb – smacks of throwing in the towel to me. Does it mean anything that Wham played City on Wednesday and were probably given the run around. The score looks pretty deceptive as City had 20 shots and Wham 2. We also have an extra day’s rest. All probably meaningless. On paper we have the easiest run-in. Also, we play 3 Jeckyll and Hyde teams next – Wham, Everton and Bournemouth. Take points here and we should be safe and may then even begin to get a bit more ambitious. Not counting chickens, but mid table is so close again that a few points can mean a lot of places. Do I care we finish 17th or 7th? The extra prize money would in theory be available for Rafa and the higher we finish the more Rafa might be inclined to stay. Or, it will not matter one bit and The Fatman will just trouser it. Sharpy17: Kim – oh to be a Fulham fan.Your club spend £100m in the summer – great we mean business! !.But it starts bad, manager sacked – but wait, a PL winning manager comes in – great we mean business.But it continues bad – manager gets sacked and with 30pts still to play for, they put Parker in charge – zero experience and a mountain to climb – smacks of throwing in the towel to me. Yeah mate, i can’t see them beating the drop at all but stranger things have happened. The owner is coming across as very impatient with managers, all managers go on bad runs but i think that because he’s thrown a lot of money at it he thinks they should be cruising it. Doesn’t work like that sadly, you need excellent scouting and team players coming in, no ego’s who may sour the cream. Just look at that Kamara incident with the pen and Mitro, Ranieri said he wanted to kill him. Something not quite right with that lot imo. I predict that Spurs will not finish top 6 next year. Poch will be off to Madrid. They have good players but who will they get as Manager with no budget. Eddie Howe. Give me a break. Some of the players will leave as well. Some have contact issues, others might have more ambition. We have seen a very good team dismantled in very short order – Dalglish at NUFC. Only the genius of Bobby Robson helped us recover. However, I think there might be a slightly rotund Spaniard that Spurs might want to steady the ship. Someone who might not have a job and has won trophies. Many trophies, which is the knock on both Spurs and Poch at the moment. Listened to the Balague programmes last night on Bielsa ad Leeds. Amazing guy but what attention to detail. Phenomenal. Balague then added he’s very like Rafa Benitez. Rafa is doing an amazing job for us. MA take note – it’s easier signing top players than finding a top coach! I wonder if Ashley will join Sullivan and Gold in the director’s box today. Now there would be 3 Fine Upstanding Citizens (FUCs). The pride of UK commerce. Sports Tat and D!ldos. The real problem for Shelvey is the emergence of Schar and Lejeune being equally good as him with the long ball. It also allows two energetic midfielders which he isn’t. It could be the end of Shelvey’s days in Toon. That formation has seen us become a very good team. I fancy a win at WestHam! There’s not much point in having money in the bank and treading water as a football club imo. Might as well spend what you have.